Despite the fact that the popularity and worldwide acceptance of Bitcoin is growing with every day, there are quite a few challenges to obtaining it. It might seem that becoming a Bitcoin owner will be easy as pie, and that it must be available through the means we all have gotten used to, such as cash, a credit card or PayPal. In reality, it is much more difficult than that, and involves either cosmic fees or a widely used identity verification procedure. The problem is that Bitcoin is currency, and just like any currency, it requires that third parties do the job of conversion and securing the deals. In the article, we will try to show you that it might be easier than you think to buy cryptocurrency and provide you with some basic information on where to spend your coins. For example, did you know you can buy gold with Bitcoin? Well, you can. There are several ways to buy Bitcoins with cash. The first (probably the most old one) is peer-to-peer in person, then peer-to-peer online, through a Bitcoin ATM, and by making a wire transfer. Let us see how it all can be done. Peer-to-peer purchasing can be worked out through the community or through specialised websites. For example, the biggest Bitcoin forum, BitcoinTalk, offers a section Marketplace where everyone can post an ad and find a person who is ready to make a cash deal through a face-to-face encounter. You should be careful and take all possible measures to eliminate risks of being scammed. For this purpose, there is a reputation system – trust points – which can be gained through fair trade on the forum. Other communities, like r/Bitcoin on Reddit, can be used likewise. People who like to travel do not always convert their money to local currency or use payment cards due to the high commissions. They might just ask the community if anyone would like to exchange their fiat to Bitcoins. Of course, you should keep it in mind that you probably won’t see this person again and, therefore, make sure that you have at least studied their forum profile. Another convenient option of buying Bitcoins with cash is through one of the Bitcoin ATMs. Sometimes, you can buy with Bitcoin fiat money, but in most cases it works the other way round. You can read about those machines in more detail here. They are, however, not that easy to find and usually only major cities in a limited number of countries have them. For instance, there used to be one in a Berlin-based bar, Room 77, but it was there just for a limited time. The same applies to the ATMs in Istanbul Ataturk Airport. If you look at the map of Bitcoin ATMs on CoinDesk, you will see that they are unproportionally concentrated in some parts of the world, mostly in Europe and the US. Thus, the usability of this method is questionable and depends on where you live. For those in, say, Chile, Venezuela, Russia, and most of Africa, this is simply not an option. You should bear in mind that if you have decided to buy Bitcoins on an exchange, this doesn’t necessarily involve having a bank account or completing some tricky verification procedures. 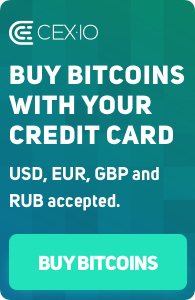 On CEX.IO, you can make a cash deposit to purchase BTC without any problem. This is quite simple. First of all, you will need to select “Bank transfer” as a payment option, and then follow the instructions. You will receive a downloadable and printable sheet with bank payment details. Then you will have 5 days to go to any bank in your neighbourhood with cash on hand and make the payment. As soon as you’re done, and the bank processes the money transfer, you will be credited your Bitcoins. Once you have acquired Bitcoin with one of the most proven ways — cash — you might be wondering about what you can buy with Bitcoin (and where). Previously on our blog, we have covered the issue of spending your first Bitcoins or a few of the most basic resources to look into – in case you are searching for brick-and-mortar places to buy with Bitcoins things or services that you are interested in. There are also a number of places offering food to buy with Bitcoin or several places to go out on Bitcoins – for US-based cryptocurrency owners. Since there have been comparisons between Bitcoin and other commodities like gold, it is quite inevitable to see emergence of services offering to buy gold with Bitcoin. On websites like Coinabul, one can find a shiny gold bar which is available for purchase with cryptocurrency. At the moment, one ounce costs approximately 5.4 BTC. There is a variety of precious metal chunks you can buy with Bitcoins. On GoldSilverBitcoin, you can not only buy the respective metals, but also sell them for BTC. In this case, however, the price will be much lower. So who will buy gold with Bitcoin? First of all, we should remember that in some countries, local currency might be even more unstable than crypto. People might be searching for ways to invest money. Why not invest in Bitcoin or gold, or both, for that matter? Also, it can be a valuable present you can make someone (just don’t forget to tell them that silver and gold are among the things you can buy with Bitcoin). In order to make a successful trade or before attempting one, you should do some research and choose crypto that you can buy with Bitcoins. Whether it is Dash (Darkcoin), DOGE, or Litecoins, make sure you have learned the trading basics and made yourself acquainted with the altcoin price charts. Combine the knowledge base you will find on our blog with your personal experience, and enjoy trading on the CEX.IO platform.